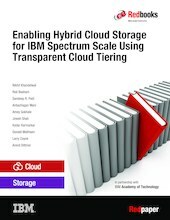 This IBM® Redbooks® publication provides information to help you with the sizing, configuration, and monitoring of hybrid cloud solutions using the transparent cloud tiering (TCT) functionality of IBM Spectrum™ Scale. IBM Spectrum Scale™ is a scalable data, file, and object management solution that provides a global namespace for large data sets and several enterprise features. The IBM Spectrum Scale feature called transparent cloud tiering allows cloud object storage providers, such as IBM Cloud™ Object Storage, IBM Cloud, and Amazon S3, to be used as a storage tier for IBM Spectrum Scale. Transparent cloud tiering can help cut storage capital and operating costs by moving data that does not require local performance to an on-premise or off-premise cloud object storage provider. Transparent cloud tiering reduces the complexity of cloud object storage by making data transfers transparent to the user or application. This capability can help you adapt to a hybrid cloud deployment model where active data remains directly accessible to your applications and inactive data is placed in the correct cloud (private or public) automatically through IBM Spectrum Scale policies. This publication is intended for IT architects, IT administrators, storage administrators, and those wanting to learn more about sizing, configuration, and monitoring of hybrid cloud solutions using IBM Spectrum Scale and transparent cloud tiering.